Yup. Another productive day at work. Outfit post later today, so stay tuned. I just had to post this Christmas tree dress in the meantime. Not comfortable for general moving around (or breathing for that matter) but looks darling, right? Can never be too early to get in the spirit, I always say. oh dear god that dress is amazing. if you end up in the bay area, can you wear that when we meet up??? what an amazing dress! So funny and so beautiful. Haha this is adorable and such a cool and creative idea! ummm thats amazing! I want a tree dress! christmas tree flapper?! I like this! hahaha omg that is soo amazing!! Haha! I sure hope this is going in the next Reno Style mag! Holiday style, all the way! Forget putting a lampshade on your head when you're drunk, just put on the tree at the office Christmas party. It is fun though. I never would've thought of it. You are too too much! 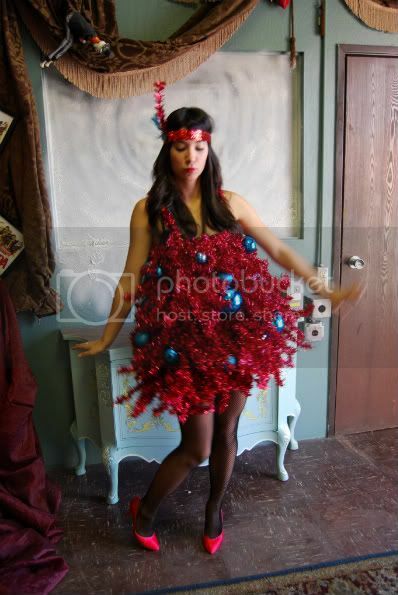 I'm so jealous, you can even pull off a Christmas tree dress!